A very nice video. To start with a T the video Is very helpful. That could help a lot of folks. Very nicely done !! Too much fooling around with the emergency brake. Learn to use your foot. who ever used their left foot for reverse? Also, I think he toyed around too much with the spark advance. "Driving a model T is harder than You think" filmed at Green field Village covered in ice and snow. Ride operations Supervisor Lisa Deuchler gives automotive writer a model T driving lesson.Lisa knows how to drive a model T which she drives everyday when the village is open.very nice person met her last year at the village. I use my left foot for reverse all the time. I want my right foot over the brake pedal so I won't back into anything. I use my left foot for reverse and right foot for brake as well. Too easy to get confused while backing and closing in on a wall and pressing the reverse pedal even harder with your right foot thinking it is the brake. Early on I learned this lesson when I inadvertently backed into a wall. Much easier to use the left for reverse. Use the same way as you use it for low and don't need to remember which foot to use. Also frees the right foot for the brake. I also use the brake hand lever at long signals to give my left foot a rest. I can pull the lever into neutral with foot on the brake. Then just push the low to start out and push the lever forward as I go into high. If you drive the T often, these things will come easy. I'm sorry I raised such a stink, but I learned how to drive a T from my Dad, who drove his new 1926 T to school for two years, through Michigan winter, spring and fall. Never missed a day nor was late. 14 miles to school. He taught me to use my right foot on the reverse and brake. Left foot on low n -high. Only set the emergency brake when parking. Nuff said. I'm not changing. only been driving Model T's for 54 years. I don't use my left foot for reverse much either. Mostly holding the clutch down with it. I use my left foot for Reverse also, I guess it comes down to how you were taught, and what feels most comfortable for you. I also utilize the Handbrake lever/Neutral more than most purists would probably admit to, and it makes driving up to immovable objects directly in front of you much less stressful. Pull it up into Neutral as you coast to your desired stopping point, and all you have to concentrate on is using the brakes. I use my left foot for reverse as well and right foot for braking. Chris, I don't smell anything wrong. Just different opinions on how to drive. No big deal. Question from a new guy (I haven't driven mine yet). When using the throttle is it ok to move it that quickly when going into high? It seems like the engine would not have that much time to rev up or rev down. P.S. I enjoy all your videos. Keep em' coming. It's customary to briefly rev up in low, raise the throttle lever as you shift into high, and gradually pull down the lever as you gain speed. Robert. If You don't reduce throttle when shifting from low to high engine will rev up "Quick" in between gears just like a stick shift car if You don't take Your foot off the gas when shifting. took me a few drives and watching a T video to figure that out. a floor gas pedal accessory would solve the problem and the hand throttle would still work for starting and cruising. Hand throttle is not a problem just haft to get used to it. Thanks! I know about the movement of the lever. It just seems like Mitch was doing it fast. I didn't know if that would change the speed of the engine by moving it that quickly. I'm so pleased to see people are finding this video useful Would anyone have any objections to me re-publishing their comments on my blog? Well,....for reverse,....left foot, right foot??? Like Steve Jelf said,...."just different opinions,....no big deal". Actually, just my "opinion", but I think there might be one other pretty good reason for making a "habit" of using the right foot for reverse. One "technique" that many won't use very often, but a technique that can be very handy is what's called,..."rocking the car". That is a "technique" whereby you place your left foot on the left, or "high/low" clutch pedal, and your right foot on the reverse pedal. With the throttle lever set properly,....say perhaps just a bit above fast idle, and when stuck in mud, soft sand, or deep snow, you alternately depress low pedal and reverse pedal to alternately move the car a bit forward, and the backward in such a rhythm as to gradually increase the distance the car moves forward and back, until finally, the car does not stop but keeps moving, and "wha-lah"!!!....success!!! The whole secret of this "technique" is the rocking "rhythm" which allows the car to move a bit further back, and then forth, each time until finally continuing on out of the "stuck" spot. ....I might add that my Dad taught me how to do this when he first taught me to drive in wintertime in Chicago (snow) when I was a kid. At that time, we had my Dad's first "NEW" car, a '51 Pontiac, which had a hydra-matic automatic transmission. Can't tell you how many times he "cussed-out" that %?#&? @# hydra-matic, because it wouldn't change quick enough from "drive" to "reverse" to allow him to "rock" the car out of deep snow or whatever, like he said he could do years before with the "ol' Model T Ford"! 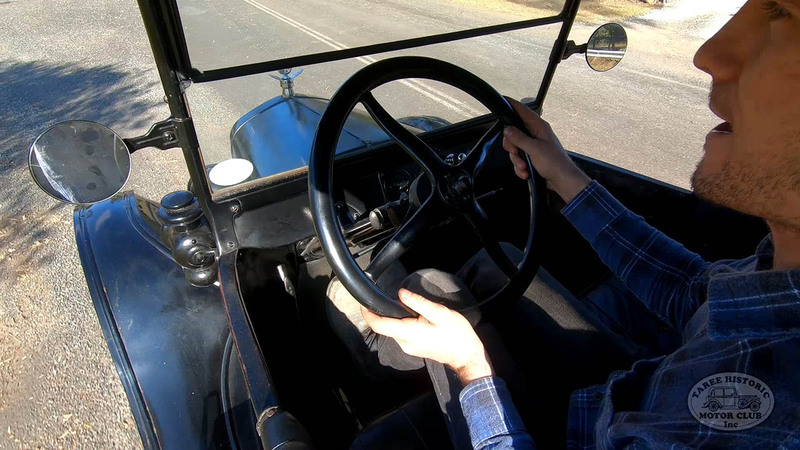 He had to use the brake pedal at the end of each forward & reverse move and couldn't establish the same old "rhythm" that he could with the Model T Ford! And we can for sure classify ourselves as experienced! Right foot, the 'r' in right stands for reverse! Answer #13 has it both ways. Using the left foot for reverse, use the right foot to brake. Using the right foot, use the low pedal to "brake" with the left. That makes my Maxwell look east to drive.